Who is getting good crops from in-ground figs in z7a? Did most of your figs recovered from that one flood you showed some of the photos? Most made it OK, although I also made the mistake of leaving many out for a cold snap in November which killed a bunch back and left dead spots on many trunks, I thought they would be fine since they didn’t have green wood and had dropped their leaves, but many died back or developed dead spots on their trunks. There were also mushrooms popping out of a bunch of pots this year, and some have loose roots so I have a bunch of repotting to do. I am cutting down on the potted figs inventory by multi Cleft grafts to 3 to 4 varieties per pot this Winter. Still got about 50 pots to go. GR Unk looks great. However, due to the pulp color and my taste preferences, there is 0% chance it’ll be better than Black Madeira. It would need a dark red interior to even think about putting it in the same class. Now… GR Unk could be a great honey/sugar fig. Even the best in that category, but that’s as far as that goes for my preferences. Yes, we can talk all we want about taste, but nothing beats Smith overall. I will have 10 trees of it come spring. Those frankenfigs are looking good. i’m hoping wilt pruf works.i have 2 trees protected by 5 coats of it. it gets harder every year to wrap my trees. i cut them back to 5 1/2’ every year, but getting the branches into a column is hard, even with ratchets. still, i expect over 1.000 figs this year soit’s worth it. i have no problems with rodents. they eat cat food but prefer the taste of game they catch. Sue, have you wilt-pruf’d in past years? I’m trying to find some hard data on successes with it. Your wrapping problem is similar to my covering problem, the bigger they get the more big scaffolds you have. Still nippy here, no wilt-pruf going on for some time. Our lowest low so far was last night, 18F. no data yet, scott. this is my first test year with wilt pruf. i’ll post results in spring. i don’t think there is any proof that this stuff works: just one story about the guy on long island. I have used Wilt Stop, and I have found it not to be very effective on most plants, but for western blackberries it has worked somewhat. Not sure of how many trees you have but have you though about planting them in rows and setting up poly low tunnels? I’m going to be growing my in-ground figs as a single 20ft hedge row and currently trialing this method here for protection. Right now I only provide them supplemental heat when temperatures drops very significantly or go below 20°F, so far this year I only had to plug in the heat three times. The added benefit (I hope) is that I will be able to use the poly tunnel as a budget greenhouse to get an early start on the growing season. I actually realized I made the mistake of planting my fig hedge row on the north side of a 6’ privacy fence - granted, at least 4’ away from it. So if anything I accidentally placed them in one of the colder micro-climates of my backyard. I guess well see how things work out come spring. my figs are too big for a hoop. my dominick will be 8’ tall by 8’ wide by next fall. if i understand orchard stats, this size will give me 700-800 figs next year. i got 300 this past season. please post your results for hedge growing. I have a couple dozen figs growing in ground and Gino’s Black and LSU Tiger came back from the roots this past season and both produced around 20 figs without pinching or thinning or protecting. I’d like to be able to give a full report but I’m not there yet. I upped my total to around 60 varieties that are in-ground this winter and were trimmed back and then only protected with tall white buckets on top – just to protect from wind and desiccation. Some of these are 5 years old and some are only two years. I should be able to give more of a report on the older ones after this season. But for now, Gino’s Black and LSU Tigers look like early favorites to keep in ground in marginal zones. Has there been a discussion of top pinching and fruit thinning of figs already? I’d be interested in reading a thorough explanation, whether on this forum or anywhere else, on how to do anything like that that I could do to improve production on figs following winters when they’ve died back to the ground. If you click on the magnifying glass and put in something like “pinching figs”, several posts came up. Yes, I’ve seen lots of talk about it, but can anyone point me to a fairly detailed how-to? 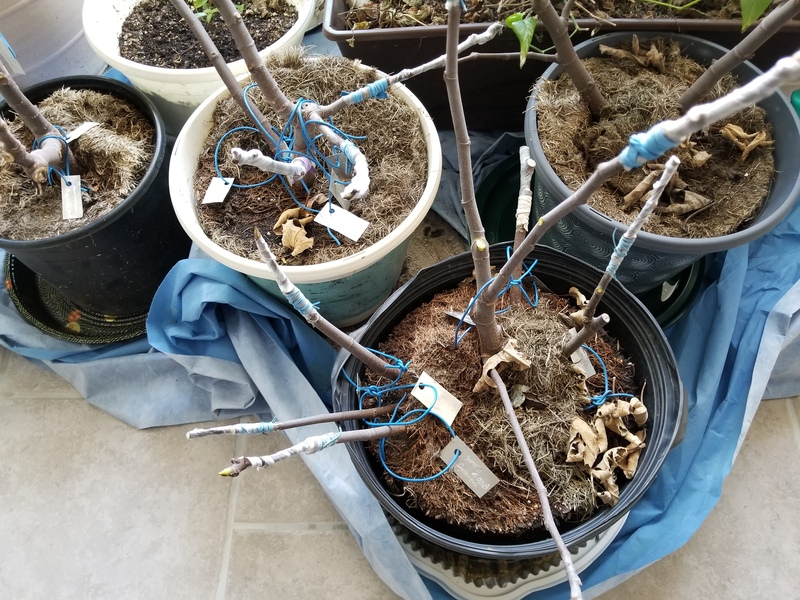 So to summarize what I think I gleaned from that video, if I have a fig that dies back to the ground in the winter, the regrowth is going to be very vigorous… if I want the fig to start putting its energy into fruiting instead of just vegetative growth, I could pinch off the last few inches from the growth point, but I need to do so at least 90-120 days before my first fall frost, and that pinching will hopefully cause figs to form at nodes below the pinching point from buds that otherwise would have remained dormant. Do I have that about right? Anything else I should know? Thanks! The main purpose of pinching is to get axillary and fruit buds to break. So on vigorous shoots you want to do that mid summer. If the variety is not precocious though it won’t make a difference because fruit buds would not have formed. Hope the big cold wave predicted doesn’t get your figs and stone fruits. Minus 26 predicted here next week near Minneapolis. pinching never worked for me. on the fig forum, it seems to work for only some people. i now wrap my trees in pink fiberglass n tarp n they don’t ever die to the ground. My dad grows them in Zone 6a Ohio by burying them in winter the way his Italian immigrant grandfather did. I’m in MD in a warmer zone, 7a, close to Scott, but I don’t like figs enough to go through all the effort.